We are almost neck and neck with last year, but with the 55 total properties pending, if they all indeed close, may inch us ahead of last year as we head into the fall. This is the height of our buying season here on the island . . . the numbers could escalate quickly as summer shoppers close escrow the end of this month and in September. Stay tuned. All-Comers is one of those things that is very “Bainbridge.” All-Comers is a free track race for all ages every Monday night of the summer. There are separate heats by age and by boy/girl. Races start at 50 meters and go to a mile. And it is called “All-Comers” because runners range in age from toddlers to middle-aged joggers like myself. Yes, there are adult races too. This year it has been back at Bainbridge High School with the newly resurfaced track (very nice) and since our house is walking distance to the high school, our attendance has been way up since last year (it was at Woodward Middle School during the high school construction and track updating). Everyone seems to be enjoying the new track and I know my kids have had a great time. 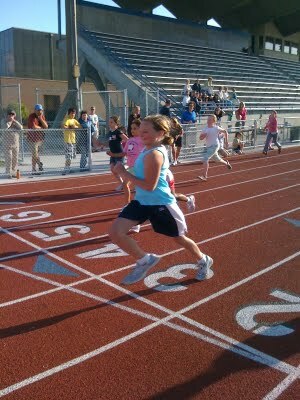 One of my daughters has had fun actually racing and the other one races around the football field with her friends instead of the track. Whichever way they do it, it is exercise none the less. And . . . the top runners of each race get their names in the Bainbridge Review. Inside Bainbridge also posts the times on their website. All-Comers is one of the reasons why it is so easy to meet people and socialize on Bainbridge. If you are new to the island, I highly recommend you grab the kids, a picnic dinner and head to the track. update: All-Comers was started on the island by Jim Whiting, but in 2015 Paul Benton took the reins from Jim Whiting when he retired from All-Comers. Thank you to Jim and Paul for all their efforts!